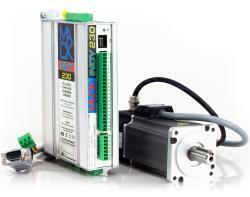 We've added a new low-cost option to our range of multi-axis MackDRIVE servo drives from Axor Industries. The new MackINDY is a range of servo drives and motors designed for single and low axis count applications where an economy solution is required. The range includes five servo drive units in two housing sizes up to a power rating of 2500W. The 1.5, 2.5 and 3.5 Amp drives (3, 5 and 7 Amps peak respectively) are enclosed in a 40 x 120 x 181mm (W x D x H) metal casing providing sturdy mounting, excellent EMC shielding and compact dimensions. The 5 and 8 Amp units (10 and 16 Amps peak respectively) are supplied in the same housing with a fan cooling unit that increases the width by only 16mm. As with the the MackDRIVE range the MackINDY series operates direct-on-line, without the need for a transformer. To aid cost reduction the MackINDY’s logic circuit is powered by the same single phase 230Vac (+/-10%), 50/60Hz main supply that energises the power stage. This gives an immediate saving as the, typically required, 24Vdc power supply for the drive logic is not needed. MackINDY also benefits from integrated in-rush and regen circuits and can also be specified with an internal EMC filter. 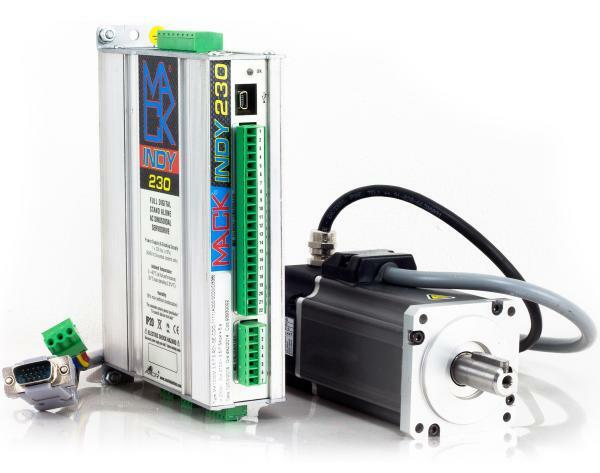 To aid quick and simplified commissioning, and further reduce costs, the MackINDY compatible servo motors are supplied as standard with a proprietary serial encoder. The serial encoder only requires two cores, making it possible to supply the motor power, brake and encoder signals over one 8 core hybrid cable. There are 10 motor options, in 4 frame sizes, ranging from 0.16 to 5Nm stall torque, with rated speed of 3000rpm. The drive offers a number of control modes including CLOCK/DIR, DIGITAL SPEED CONTROL, ANALOG SPEED CONTROL, DIGITAL TORQUE CONTROL, ANALOG TORQUE CONTROL, ELECTRICAL AXIS (GEARING), CANBUS and ETHERCAT. Emulated Encoder Output, Safe Torque Off and incremental or absolute Encoder Feedback are also available. One-off OEM prices start around £800 for the servo drive, motor and hybrid cable, with volume pricing around £600 per axis. Request a quote.